Description As in the companion "Allegory of Arithmetic" (Walters 37.1917), this personification of the liberal art of Grammar is engaged in an activity to show how ideas impact real life. 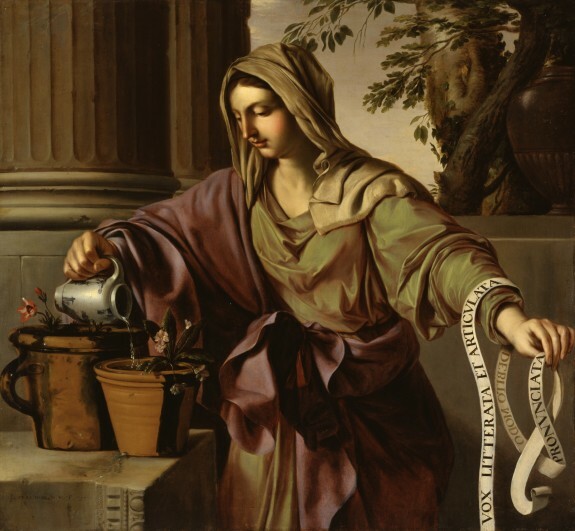 To demonstrate how important grammar and clear writing are in making ideas "bloom," the artist metaphorically represents Grammar watering two pots of flowers. Over her arm is a scroll bearing an ancient definition of grammar in Latin: "A literate tongue, spoken in the required manner." By the inscription, L. DE LA Hyre In. & F. 1650-"In." is an abbreviation for invenit (Latin for invented) and "F." for fecit (made it)-the artist emphasized his responsibility for the conception as well as the execution of the paintings.